It’s been more than a week now of Israel murdering Palestinians in Gaza. To be clear, their deaths were not the result of “clashes” or “violent confrontations.” It started with tens of thousands of Palestinians, imprisoned in Gaza, marching. Along with their extended family throughout our historic homeland, they walked nonviolently toward their ancestral villages and cities, in many cases located just a few kilometers away. A militaristic state that sees them as unworthy of the most basic human rights has mowed them down. That’s what happened. And that’s what always happens. My fellow Palestinians were marching on Land Day (“Youm El Ard”), a day where we commemorate the theft of Palestinian land in the Galilee in the mid 1970s. See, we Palestinians don’t really have traditional “holidays.” We just have “commemorations.” May 15, 1948. That’s called the “Nakba.” We observe that day because they stole our land. June 5, 1967. That’s called the “Naksa.” We observe that because they stole our land. March 30, 1976. That’s called “Land Day.” We observe that day because they stole our land. Perhaps you’re noticing a pattern. That’s what 70 years of occupation does to you. In all truthfulness, we do actually have one major Palestinian holiday. It’s called “Christmas.” But the world has been trying to take that away from us for centuries. Dear people of the world, Jesus was one of us. He didn’t have blonde hair and blue eyes. He had brownish-olive skin, brown hair, brown eyes, and hairy knuckles. He bargained whenever he shopped (I’m sure he got great deals). In his house, rice was a food group. His family bugged him about getting married and having kids. He was Palestinian, through and through. So you all can celebrate Christmas loudly and proudly. Just remember where it started. Jesus stood against foreign occupation. He loudly and brashly denounced his oppressor. He was murdered by a military force that sought to silence his voice and his movement. While his persecutors might have killed his body, they failed marvelously in crushing his message. Sounds pretty Palestinian to me. We Palestinians are Israel’s constant reminder. And this is what Israel hates most. We are being killed precisely because we won’t bow down. Our imprisonment, exile, and dispossession are not sufficient for our occupier. It’s not enough for Israel that we are its victims. We must shut up too. For Israel to truly feel secure, simple surrender is not adequate. We must also gladly accept our presumed fate. We must become accomplices. And in this, we have always loudly refused. And that’s why we must be killed. Israel can’t get why their efforts don’t work. After all, their founding father told them, “The old will die, and the young will forget.” Well, our elderly are still telling us stories. 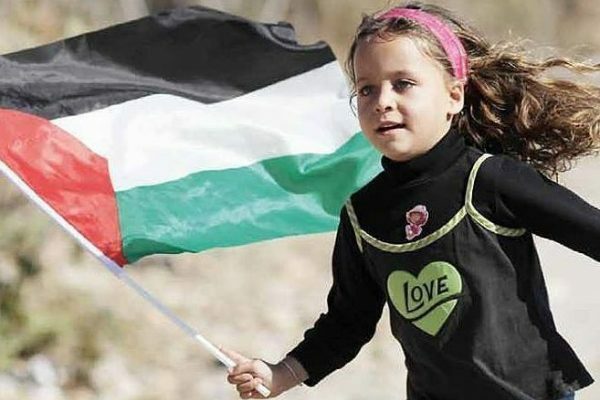 And today, there’s Palestinian children in every corner of the world still listening. On April 9, 1948, exactly seventy years ago today, over two hundred Palestinians were massacred at the village of Deir Yassin outside of Jerusalem. Their mass murder was meant to strike fear, to silence us, to expedite our abandonment of our own history. But we Palestinians just can’t seem to remember to forget. And finally, Israel cannot quite grasp why, after being murdered and massacred, we keep coming back, bringing more “demographic threats” into the world, at a rate that rabbits envy. Well, I’ll clear up any confusion. It’s because while being Palestinian comes with more than its share of sadness and despair, it’s also the most beautiful f-ing thing in the entire world. But for all the things Israel doesn’t understand about us, there’s one thing about it that I just can’t wrap my head around. If they remembered their roots after two thousand years, why do they think we would forget ours after just seventy? This is such a brilliant post – but I disagree about the “hairy knuckles” stereotype. Lol. Neither my father nor either of my brothers have hair on their bodies & only one can grow a beard/moustache. We are very Asiatic looking indigenous Lebanese from Marjeyoun. Speak for yourself! We will rise again also. InshaAllah hand in hand w/ all the other daughters & sons of the God’s earth including Jews. I’ll post some poems for everyone. I hope you like them. All night I dreamt we had to fight a war with things found only in nature. We waded near the shore collecting things washed over by waves. We picked through the brambles for pods caught by the thorns. We searched the saltwater while a tiny amber colour man taught us about occupation and how to fight it – and how to look for old empty shells covered with Green. All night I dreamt we would defend ourselves with bits of fluff and stones. The most profound post I have read in a long time. Keep telling your truth, habibi! Yes, Issa was Palestinian. However, I beg to differ on two salient points: “He loudly and brashly denounced his oppressor”. Christ did not denounce the Romans, who were oppressing the Jews. All three synoptic gospels state that hostile questioners tried to trap Jesus into taking an explicit and dangerous stand on whether Jews should or should not pay taxes to the Roman authorities. The accounts in Matthew 22:15–22 and Mark 12:13–17 say that the questioners were Pharisees and Herodians, while Luke 20:20–26 says only that they were “spies” sent by “teachers of the law and the chief priests.” Jesus first called them hypocrites, and then asked one of them to produce a Roman coin that would be suitable for paying Caesar’s tax. One of them showed him a Roman coin, and he asked them whose head and inscription were on it. They answered, “Caesar’s,” and he responded: “Render therefore unto Caesar the things which are Caesar’s; and unto God the things that are God’s.” Christ had no intention of rising up against the occupying government, for his was a kingdom not of this world and religion and state were two separate spheres of influence. He did, however, rebel against the corruption in the temple, when he attacked the moneychangers. In Mark 12:40 and Luke 20:47 Jesus accused the temple authorities of thieving and this time he names poor widows as their victims, going on to provide evidence of this in Mark 12:42 and Luke 21:2. Merchants were selling doves that were sacrificed by the poor who could not afford grander sacrifices and specifically by women. According to Mark 11:16, Jesus then put an embargo on people carrying any merchandise through the Temple—a sanction that would have disrupted all commerce. “He was murdered by a military force that sought to silence his voice and his movement.” Actually, the Romans were but a tool in his crucifixion. The religious leaders wanted Christ dead because he claimed to be the Son of God, he performed miracles, he associated with “unclean” persons, like the Samaritans, tax collectors, prostitutes, etc., he defied the religious customs, like telling a crippled man to take up his pallet and walk on the Sabbath, which was considered breaking the law by “working.” The high priest Caiaphas arrested Jesus, tried him in a kangaroo court and convicted him on a religious charge that carried the death penalty. Jesus threatened Caiaphas’s authority. Caiaphas could not afford to allow any upstart preacher to get away with challenging his authority; especially not at Passover time. This was the biggest Jewish festival and scholars estimate that around two and half million Jews would have been in Jerusalem to take part. Caiaphas did not want to lose face. Caiaphas’ power base lay in the Sanhedrin. The Sanhedrin only ruled because the Romans allowed them to and the way to keep the Romans happy was to maintain order in society. Caiaphas himself was a Roman appointment, so he needed to keep cosy with the governor, Pilate, if he wanted to stay in power and preserve his luxurious way of life. Jesus was undoubtedly a threat; the public liked him, indeed they may have been paying more attention to Jesus than to the priests, and the public were listening to his condemnation of what he saw as wrong in the religious establishment. Caiphas had Jesus brought before Pontius Pilate to transfer the matter into Roman hands, since he had no authority to carry out the death penalty. Pilate read the reports that he had from his officials and saw that it was quite clear that Jesus wasn’t leading a military revolution. There was simply no evidence against Jesus. Pilate said, “this man is innocent.” The crowd was angered by the verdict and began to shout for Jesus to be crucified. Pilate faced a dilemma: If he released Jesus there might be serious riots. But the alternative was to execute an innocent man. Pilate tried to get his way out by using the Passover amnesty card by which one prisoner would be freed. He gave the crowd a choice between Jesus and Barabbas, a convicted murderer. But the crowds cried out that Jesus should be crucified and that his blood would be on their heads and those of their children. Pilate declared that Jesus was innocent and condemned him to death by crucifixion. Then he symbolically washed his hands in front of the crowd, telling them he was innocent of Jesus’ blood. I would say that, ultimately, it was God the Father who killed God the Son. Please remember that since the Church was Hellenised & Romanised & allied w/ the state as the state religion we have had a sliced & diced & Roman book passed down to us. Once Constantine painted crosses on the shields of his soldiers the thread was lost. I am an Aramaean. Most of our earliest Syriac writings were destroyed by the Romans etc. We have been a colonised people long before Zionism. Hence I find the ‘Give to Caesar what is Caesar’s’ statement – said to be from Jesus – highly suspect. Zoé, if you render unto Caesar what is Caesar’s and unto God what is God’s you give nothing to Caesar. Everything he has he owes to his Creator. If he owned even his own soul he could decide not to die. If you see the quote from this viewpoint it means “nothing to Caesar, everything to God.” Which is the way followers of the Prophets see everything. Thank you Rais. I understand what you are saying – but it has & is used in the post Constantine church (since the church became wedded to state affairs*) as a validation for followers (Christians) to pay taxes & go to war. Thank you for your spiritual clarification though. Speaking of Jesus – lol – it would be nice if you would occasionally throw some bread & fish to the followers in your threads. Interesting thing, cause in these troubled times we live….Jesus was a Jew. There is no discussion about it. He was born from Jews, among Jews, lived among Jews, and his first followers were Jews. I don’t think anyone is saying he was not a Jew and not Jewish. This is a misunderstanding that comes up all the time. To be Palestinian does not describe a religion. It is a region and a culture. There have always been Palestinian Jews and Syrian Jews (Mizrahi) indigenous to the area w/ other people there. Jesus spoke Aramaic. That is the Syrian language. Even now linguists say Lebanese Arabic consists of 50% Aramaic words. My grandfather spoke Aramaic as he was from the mountains in South Lebanon and an Aramaen (Syriac) Christian. What is happening in this argument (& other arguments) is Jewish people who we see as our cousins separating themselves from us out of their disdain for us; whilst we indigenous ‘Syrians’ (inc. Palestinians & Lebanese) see indigenous Jews from then Roman Palestine/Syria as our cousins from the beginning of time. (We are all proven to be from this area since prehistoric time. This has been done w/ DNA & ancient teeth found. See the National Geographic reported studies). What we are saying when we remind people across the entire world that he comes from this particular place; is that he was not a pale blonde w/ angular bone structure and blue eyes as he has always been portrayed. Nor did he look like a sweet faced light brown haired brown eyed Ashkenazi looking boy as portrayed in Flemish paintings. What we are saying is he was one of us… and by saying *that* we are saying that indigenous Jews are one of us… one with us. If you have not noticed this Jewish Rabbi has been co-opted and all his Southwest Asian Oriental Syrian Palestinian Jewish origins erased by anti-Semitic Europeans. Do you remember Andalusia? Please realise that you have blind spots. By calling him ‘Palestinian’ or ‘Syrian’ we are saying that indigenous Palestinian & Syrian Jews have always been our brothers & sisters. We literally call them our ‘cousins’ in daily discourse. We are saying they belong in Palestine & that we belong in Palestine. We are saying that we love you. And that it is time for you to love us. Please read Amer’s words about not being understood above Habibi/Habibti Reader. Also ‘a reader’ (screen name given who I am answering) please know that when Crusaders came and raped & massacred us – they did this to indigenous Jews & indigenous Christians & indigenous Muslims alike. That is because we all dressed exactly alike then. And we played the same musical instruments as we still do & ate the same foods as we still do. We call this culture (musical instruments / clothing / building styles & decoration / embroidery etc.) Syrian. We are all indigenous people who were Arabicised after the Arab conquests. Hence ‘Arab’ describes the lingua franca of Jews & Christians & Muslims. You may be confusing it w/ religion. Furthermore the early Christians were Jews & later intermarried w/ indigenous non-Jews so all were called Christians (Nazarenes and later Romans) & later many of those Christians converted to Islam after the Arab conquest. There were some Arab Christian tribes as well. We cannot separate ourselves – those of us who are indigenous to the area. This is proven by DNA. We do have different DNA from Europeans but not from other people in Palestine / Lebanon / Syria etc. For those who were raised on generations of victim mentality, “Hard to Understand” is not even part of the equation. There is nothing to understand but ones own survival from a perpetual victim point of view. They are not capable of trying to understand anybody else. It is a diagnosable mental illness. We saw the sinister symptoms on the ground during the recent Great March of Return. We see this among rabid West Bank settlers. It is not self fixable. The only remedy is outside help. Fortunately the Palestinians have maintained sanity under 7 decades of insanity on all sides. I’m sorry it’s a lie people what he wrote and it’s not true ,,Jesus wasnot sure to be brown skin olive oil like other Palestinian who want to tease the world, and taking one sided of the story is not valued ,, Israel will push back even with arms the one who is coming inside it’s land. Even if that was still not saying it’s there own. And don’t mention I don’t know even if u are Palestinian , and even I’m proud to call me ex Palestinian and even Jesus all that ibrhamitic came from Iraq and his father is not native to Palestine and also the media and others want to show it, no mention false information and taking one side and must upgrade ur argument and believe me typing English that in USA or Russia the beloved by Palestinians citzen of that countries get shot and go jail. So marching for a reason that’s ur own land it wasn’t set or it was fake and false and doesn’t come with it’s own legal right and still will be complained about victimized and others. And off course palestinians doesn’t want to anybody to be against or fronting. Civil Arab since when it’s there and since too many people says they are not arabs. The land doesn’t go for Arabs who doesn’t look like Jesus him self lol and also ur name is Amer and it’s egyptions name so are u trying to get close to egyptions ?? Fake media this one. and I never undertsand if u know there is no help from ur own calling people why u begin with ?? Who shred life ?? Who make people to die ?? The chance for traders to trade the name of Palestine for a fake March, and Palestinians in USA doesn’t believe there is United Nations and they still living there life as normal lol, no mention they going to remove the name of the govemrent from the name of citzen. No mention they ask Egypt to interfere for there business and they ask help from the same countries that oppose them. Is that mental illustion or what ?